Sometimes I help friends that make their first steps in Linux world/shell scripting/etc. I’ve found that the best way to give remote technical support is over a “shared” terminal window. It can be done with screen commnad (short tutorial here) or kibitz which is part of the standard expect package. The basic operation is similar: the side that needs to be controlled creates the “shared” terminal, the other side first connects to the same machine (telnet/ssh) and then “attaches” to the shared terminal. This scenario, although reasonable has couple of limitations. First, to support someone, a new shared environment has to be established. You can’t attach to existing terminal window (unless inside “screen” already) which is inconvenient. Second, a shell access is needed before attaching to the shared terminal (unnecessary privilege) and third, you can’t connect to the shared terminal (as server) which could have been really usable for NAT/Firewall bypassing via reverse ssh tunneling. Output redirection of running process using gdb. This method uses gdb‘s ability to attach to already running process, freeze it’s normal execution, run arbitrary code and continue. In this particular method stdout is closed and reassigned to another file. Pretty neat! Here, the same method is used but instead of closing stdout, it is duplicated to a new file descriptor. Retty is a “tiny tool that lets you attach processes running on other terminals”, which means you can reattach to any open terminal window (for example text editor, mail client etc…) from any window. The original session would be destroyed though. Unfortunately, retty can’t run on amd64 platforms (like mine) because it injects i386 assembly instructions into running processes. Retty’s functionality can be achieved, again, using gdb method with this script. 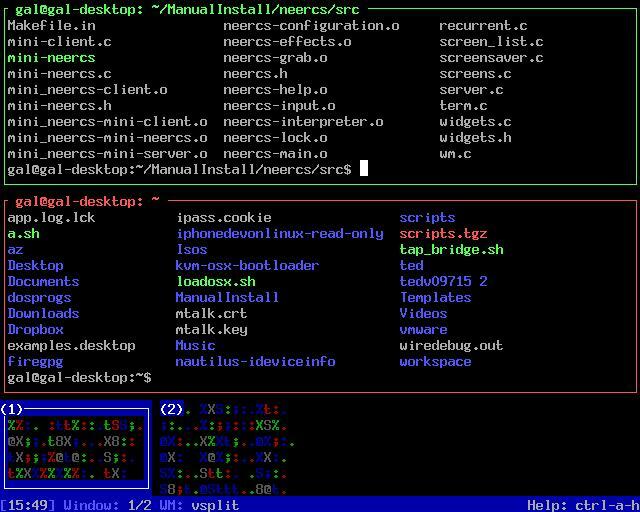 Neercs is very similar to screen but has unique features such as grabbing a process that wasn’t initially started inside it, different window layouts etc. It is based on libcaca, so when I built it I had to manually get latest version of libcaca, build it, and then build neercs against it (if anyone need help with this just leave a comment). Neercs uses similar grabbing mechanism to retty’s, but they made both i386 and x86_64 assembly. From my tests it’s little less responsive than screen and it has problems passing F keys and Alt-* keystrokes. That’s all. If anyone has better solutions I’ll be glad to hear them.